This mare has some problems with the right hind leg (possibly in the stifle region) which are being addressed using Osteopathy. This has also had some impact on the wear and growth patterns of the left fore. However, from a hoofcare point of view, the most interesting hoof is the right fore. This hoof developed a major quarter crack that went from ground to coronet band and appeared to penetrate much of the way through the wall. The mare had been lame for some time and had abscessed at least once on this foot. 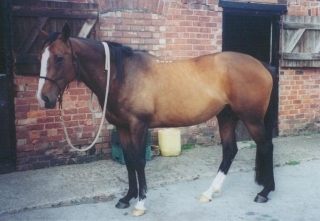 This long period of acute lameness on the right fore had an adverse effect on the movement of the problematic right hind and it was this severe gait issue that led to the mare being referred to a university-based veterinary hospital. During her assessment at the veterinary hospital, staff began to suspect a keratoma (a benign tumour of the hoof wall that can cause serious wall cracks) on the right fore. It was felt that no further progress could be made on the right hind lameness issue until the keratoma issue had been resolved. 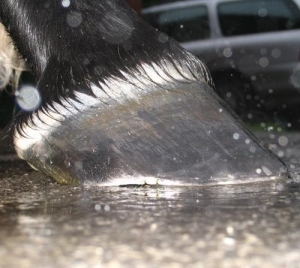 The farrier and vets were seriously considering surgery for the keratoma however it was decided initially to try a period of remedial shoeing in an attempt to improve comfort levels. 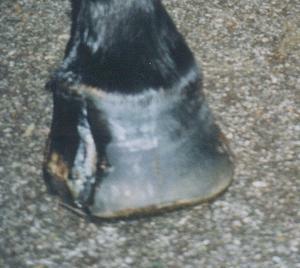 The application of heart bar shoes did stabilise the crack to some extent but the mare remained lame. The owner eventually decided to take the horse barefoot as a last resort. On pulling the shoe on the right fore, there was an immediate strong stench of infection. 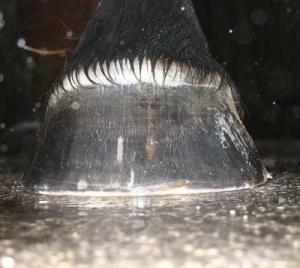 The smell was typical of severe White Line Disease which has been present in the hoof for some time. As a result, it was felt that no decision could be taken on the presence or otherwise of a keratoma without first dealing with the significant amount of infection present. The hoof was treated with a disinfectant hoof soak and within a week or so, the smell had gone. From that point onwards, the crack and associated horn damage gradually grew out. Within a few weeks it became clear that the majority of the damage to the wall had been caused by severe White Line Disease rather than any keratoma that might or might not be present (although a keratoma might have been the initial trigger for the infection). At the time of writing, the quarter crack has entirely healed and the only remaining sign of damage is a slight deviation to the white line – and even that is slowly disappearing. It is now felt that it is highly unlikely that there is a keratoma present. With the lameness in the right fore gone, the mare is moving much better (including improvements in the right hind) and early results from the osteopathy appear promising. The photos below show the right fore at the point of referal to the veterinary hospital and after 10 months of EP care.